WASHINGTON TOWNSHIP – A local police officer was killed in a crash that occurred on Monday night on state Route 219, in Washington Township, Jefferson County. According to DuBois-based state police, 32-year-old Corey Alan Williams of Reynoldsville and 33-year-old Patrick Charles Straub of Kersey were involved in the collision. State police say around 7:10 p.m. Monday, Williams was traveling south on SR 219, just south of Brubaker Road, in Washington Township. He lost control of his 1997 Jeep Cherokee and traveled into the northbound lane of SR 219, striking Straub’s 2015 Toyota 4 Runner that was traveling north on SR 219. Both Williams and Straub died on the scene as a result of their injuries, according to state police. The passengers of the Toyota – a 34-year-old woman and a 3-year-old girl, both of Kersey – were transported to Penn Highlands for treatment of minor injuries. 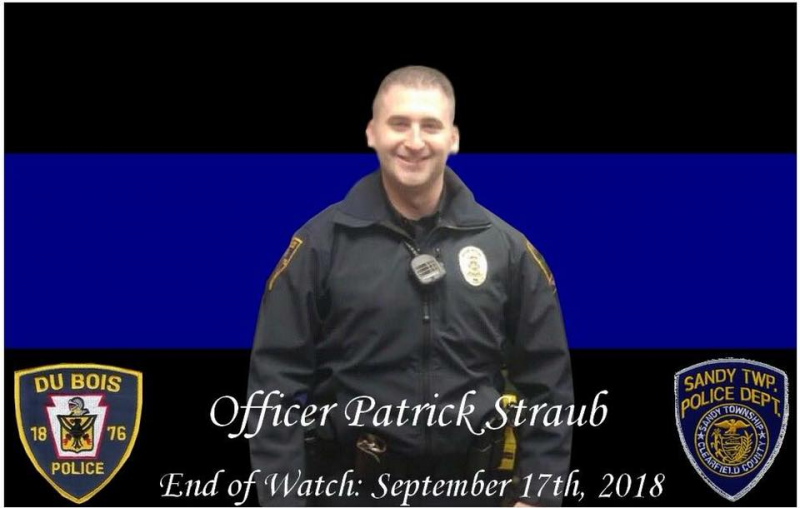 Straub was an officer for both the DuBois City and Sandy police, both of which expressed deep sadness on the departments’ official Facebook pages. He was off-duty at the time of the crash. Sandy Township and DuBois City police will be departing from Punxsutawney at 6 p.m., and escorting Straub to DuBois by approximately 6:30 p.m. The departments will then travel on to St. Marys to the funeral home.